Can you believe it's September 1st?!? 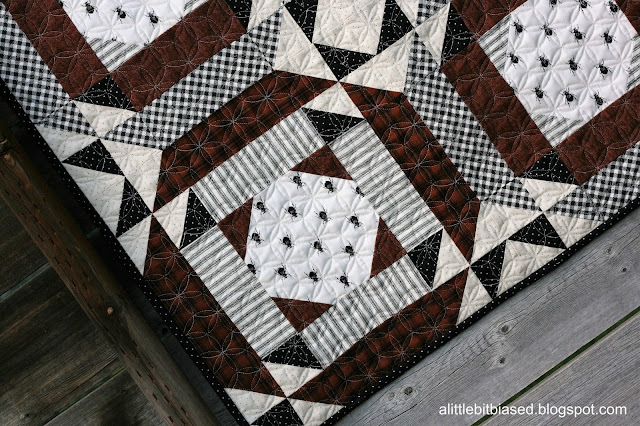 That means it's time for another Five Fat Quarter Fun pattern! Raise your hand if you're getting in the mood for Fall! I know I sure am! Summers are hot here in Utah and I am looking forward to some cooler weather, sweaters and boots, and all the pumpkin things! Yay! 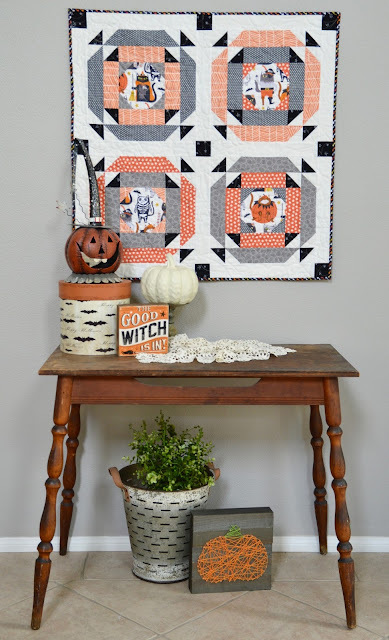 This fun little quilt is called Little Spooks and I had all the "Fall feels" when I was making it. I pulled out a cute little beetle print that I had in my stash and bought a couple of rust colored woven prints that make it feel so soft and cozy! 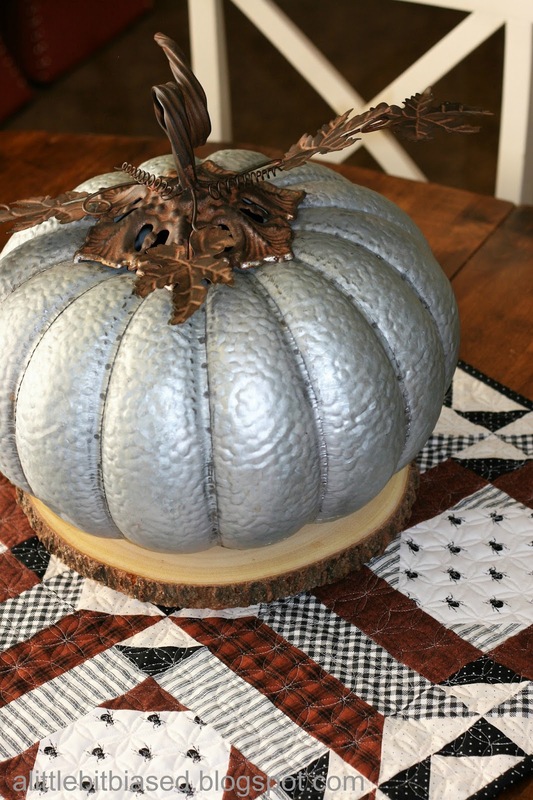 It does call for sashing but I just wanted a table topper so I left off the sashing so it wouldn't be too big for my table. Don't judge, but I pulled out some of my fall decorations the other day. Is that too early for you? It was still August when I did it, LOL! It's just that I still had my Fourth of July stuff up and I was too lazy to put up other decorations for one month until October 1st rolled around. Plus, what do you even display in September??? 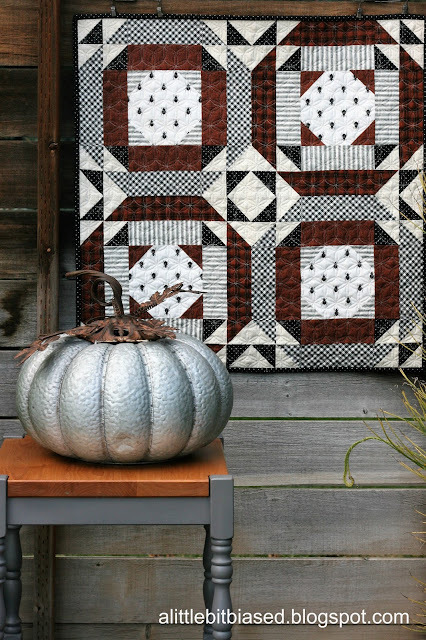 Okay, do you recognize this quilting pattern? I use it all the time! It's called Interlocking Orange Peel. I just feel like it's a good basic. It's almost like a stipple, to me! And I'm so lucky to have a long-arm quilter a few houses down from me. Her name is Cathy Barney and she is soooo good to me. She does a great job and has a quick turn around! This is a fun little pattern. One you could whip up in a day or two, if time permits. And it would be great in any color scheme, showcasing some of those theme prints you have laying around that you don't know what to do with! 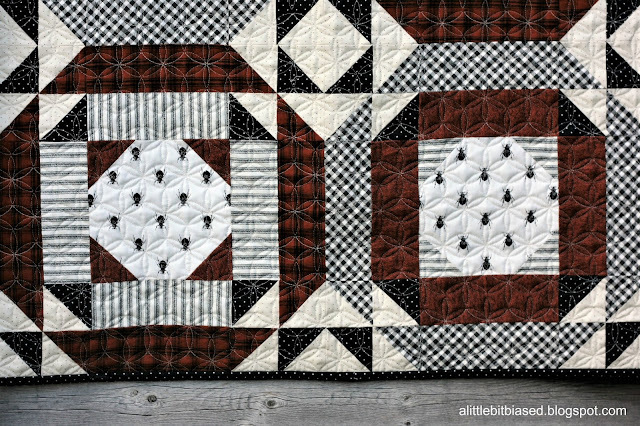 I really enjoyed making these blocks and think they would make a really stunning full size quilt! Well, if you haven't heard, this is the last pattern that Amanda and I are posting for this Five Fat Quarter Fun series. 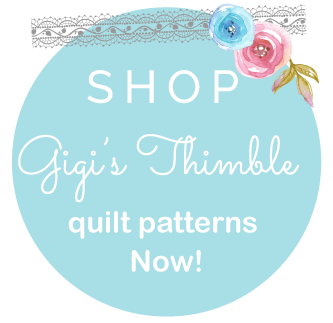 We've really enjoyed coming up with quick, easy patterns that use just FIVE fat quarters (plus maybe a little yardage to finish it off). Be sure to stop by the Five Fat Quarter Fun Home Page for all the details about how this idea came to be and to check out all 10 of the free patterns! 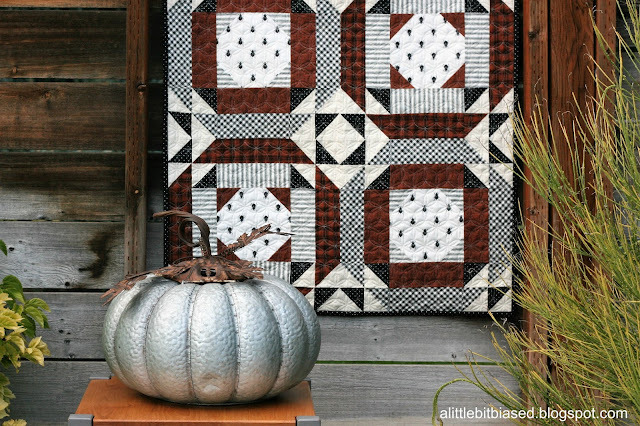 Tell me though, have you made any of these Five Fat Quarter Fun patterns? 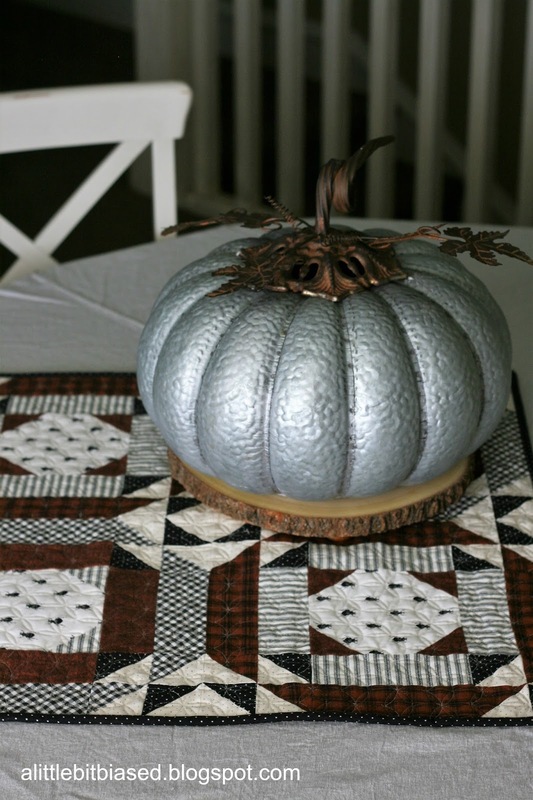 Have any of you tried to make all of the 5FQF patterns? Well, either way - you need to check out my blog post HERE. Amanda and I are hosting a 5FQF contest that started a few days ago and ends October 25th. We have TONS of great prizes and will be picking 3 winners. It's a great opportunity to stretch yourself creatively so we hope you'll accept the challenge and get making!!! The post has all the details so go check it out! Love your little quilt - it is the perfect size for my 'little's' collection that I make for charity. Love how you can showcase a special fabric in the centre, then surround it with coordinating fabric. 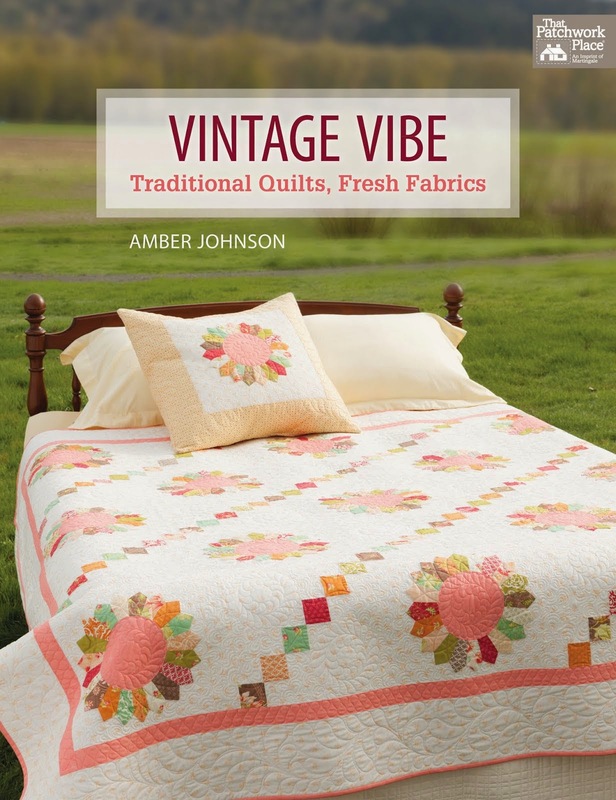 Love the quilting on it. 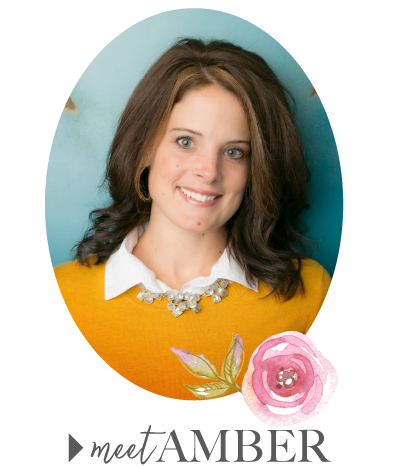 Thank you, Amber, for hosting the Five Fat Quarter Fun with Amanda. I have really enjoyed it! Well you ladies have done it again-another cutie!! Thank you for your generosity, I have loved making a couple of your freebies so far. I am not on instagram or I would enter the contest. I love fall but I am not wanting it yet-I need more summer! 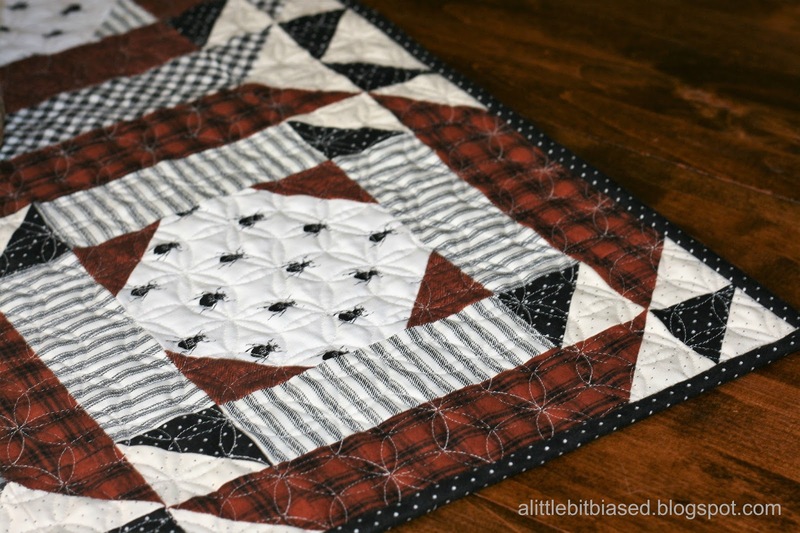 Cute little quilt! 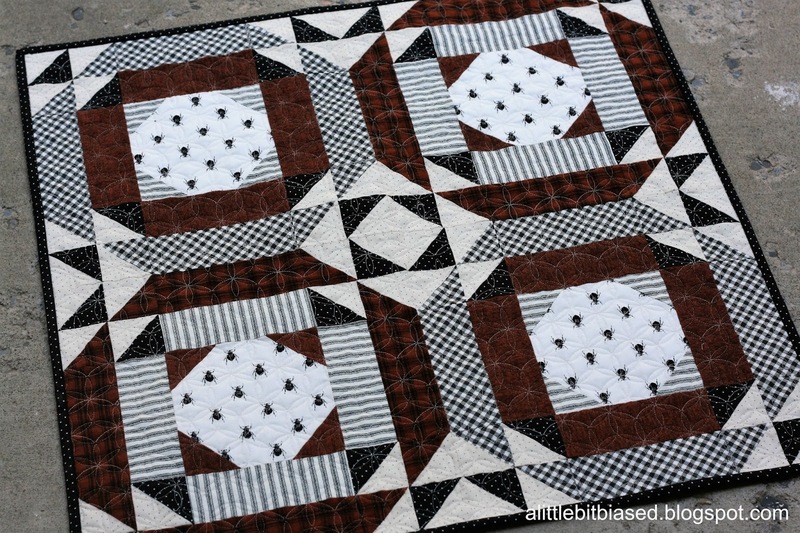 I enjoyed all your 5 FQ patterns but didn't make one yet. 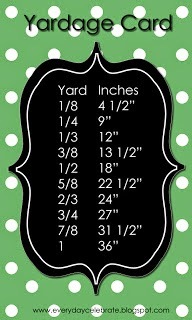 But I'll make a quilt for your 5 FQ contest becuase I love to play with patterns and fabrics. 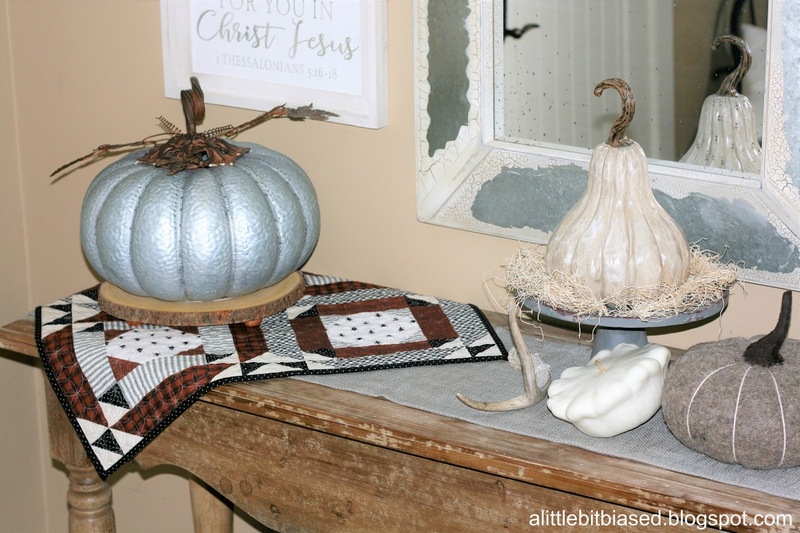 I am enjoying seeing the fall décor, but I am not ready for the change yet. The quilt is such a nice addition to the autumn setting. This has been a really enjoyable monthly challenge and yes, I have done a couple of months and saved some info for some of the others.... sorry to see the last one here and thank you both for taking the time to make each month enjoyable and interesting.